Life continues to return to normal here after the collision. 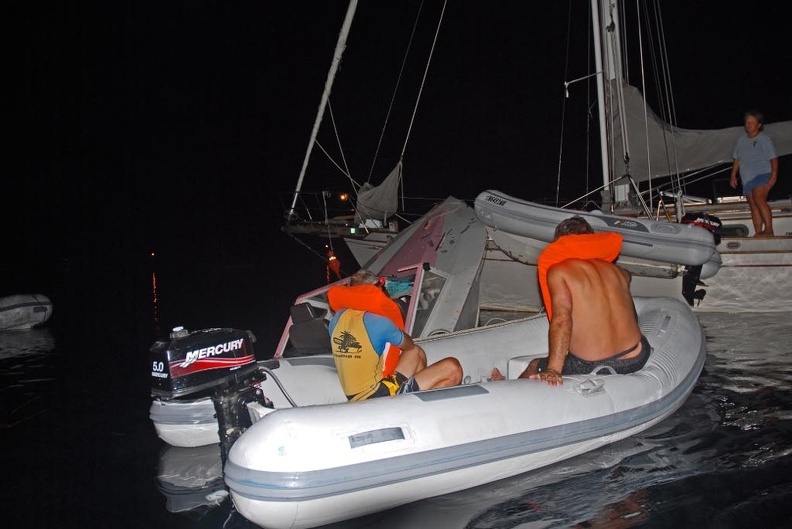 We’ve gotten to know Michael and Gerald on Eva, the other boat that was hit, pretty well through all our trips to the Gendarmerie, chandlery, and other marine businesses. Nice thing about cruising is there is always a silver lining. The local businesses have also been extraordinary. Jean-Noel at Bora Bora Marine gave both boats repair estimates that were required to document the damage, at no cost. He couldn’t even expect repair business out of it because his shop doesn’t do the stainless, hull, or wood repairs required. After he dropped off our estimates he gave us a ride to the Gendarmerie. Gerald was in the front with Jean-Noel and convinced him to accept compensation for all his work on our behalf. Jean-Noel also called Raitea and set up my trip for stainless steel repairs. Today I took the express ferry over to Raitea, arriving at 9:30 am. Greg from ALUNOX Marine picked me up at the ferry terminal and drove me to the shop. He and Claude measured the lifelines and sent dimensions to a business in Papeete for a replacement estimate. By the time we left the shop at 12:45 for my one o’clock ferry back to Bora Bora, Claude had straightened one gate stanchion and welded new sections into the other two bent stanchions. They also firmed up the order for the lifelines and arranged shipment to Bora Bora for delivery next week. Never thought I’d have three fixed stanchions that quickly. Arriving back in Bora Bora early, I met Teresa at the Gendarmerie where we learned our visa extension had been approved and we received our official extension, good until Sept 10th! Jean-Luc Chombart, the Commandant, provided assistance in writing letters, faxing all required docs to the officials in Papeete, and calling several times to keep things moving. None of this is the responsibility of the gendarmes, he was just helping us out. A very successful day, indeed, thanks to the locals. It looks like the repairs, not counting my time, are going to cost us around $500. I don’t mind though. When I think back to Monday night, that single moment when we were tracking the speedboat with the spotlight and it was a second or two from an inevitable collision with us, it would have never occured to me that we would have a fixed boat again for only 500 bucks. That’s it for now, I think I’m ready to be done with the collision aftermath. The diversion the past week has had its interesting moments but seems to have consumed the last 4 days with no time left for anything else. We’ll have to remedy that and switch over to tourist mode. I only wish Michael and Gerald on Eva were as close to finished as we are. Today on Yohelah we are tired but happy to have the repairs under control and ready to discuss dive sites rather than collision sites.